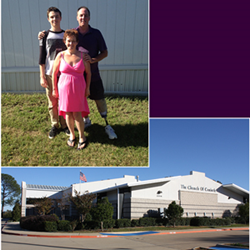 A local family in financial crisis receives the support of Hickory Creek, TX after a life-changing injury. Mark Tucker Insurance’s ongoing Community Program brings awareness of their plight to the local community. We try to help families every day through the work that we do. When we learned about the obstacles these folks have faced recently, we felt an obligation to do what we could to help. It’s all about neighbors helping neighbors to make our community strong. Faced with a life-altering injury, a local family is receiving support from the community through the efforts of Mark Tucker Insurance. Michael Heath sustained an ankle injury which led to amputation. The resulting medical bills, unemployment and the loss of their home have presented true challenges. The initiative aims to provide both emotional and financial support for this worthy family. Those who also believe in extending a helping hand to neighbors in need may now view and contribute to the campaign through http://marktuckerinsurance.com/Hope-for-the-Heaths-_18_community_cause. Michael, his wife Kelly, and son, Chase were living the life of an average American family when Michael sustained an ankle injury while gardening, which resulted in amputation. Their problems snowballed from there. Chase has found a lot of support at church and much of the community has rallied around the Heaths. With their agency in Hickory, TX, Mark Tucker Insurance is employing its social media channels, email and text message communications in the campaign, and dedicates a full page of their monthly magazine to the cause. The electronic version of Our Hometown magazine may be viewed here: http://marktuckerinsurance.com/Our-Hometown-Magazine_44. In addition to promoting the campaign to gather donations, the agency will also contribute $10 to the family for each person recommended to them for an insurance quote – no purchase necessary. Operating as agents of change in the community, Mark Tucker Insurance will continue to support worthy causes, and any member of the community may request to be considered for future campaigns through this link: http://marktuckerinsurance.com/Submit-A-Community-Cause-Idea_47. Entries are diligently reviewed, and the selected causes will be contacted by a representative of Mark Tucker’s Community Program. More information regarding past and current campaigns supported by the agency may be found at http://marktuckerinsurance.com/community-cause. Mark Tucker Insurance’s mission as a team is to provide the best insurance and financial services in the industry. Their number one goal is to protect the assets for which their clients have worked so hard, and to help them invest so they are able to retire in comfort. Mark Tucker’s success is measured by customer satisfaction and the value brought to their customers’ lives. The capable agents at Mark Tucker may be easily reached at 940-321-1881. More information about the company may be found at http://marktuckerinsurance.com/.